Ace Printing and Mailing Services began in 1947. In 2002, Rod Shoja, took ownership of Ace Printing and Mailing Services. Rods' community minded business sense has fostered many individuals and organizations to thrive throughout Marin County. Rod and his team of experts at Ace, strive to meet the clients needs in a timely, efficient and friendly manner. Stop in and see Rod and the team at Ace Printing and Mailing Services. 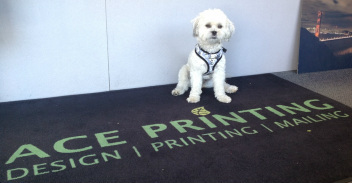 Don't forget to look for our visiting Mascot, Pippin! Our commitment is to make your business communication easy. That means doing it right, reasonable, and on time. We are located in San Rafael, and we work with customers in Marin, North Bay, South Bay, and East Bay. We guarantee that you will be satisfied with our service, so contact us before you go anywhere else for your design, printing and mailing needs.